The Money Robot installation process, I have described the software installation process step by step here, it is not hard to install it, but somehow I had some problems creating my first 7 days trial version account and I described step by step all the installation process of Money Robot in this topic. Money Robot software is actually solving the simple captchas for free, but the complex captchas can't be solved automatically, so this requires a decaptcha account, here you can see how to purchase a 2captcha.com account for $10 (about 12000 captcha solved package) this account usually is enough for 1-2 months and it will auto solve the captchas for you and it will send back the solved captchas to Money Robot automatically. Remember this process of purchasing of decaptcha account is not absolutely necessary, but recommended because it will save time. After you purchased the captcha account, you need to insert your 2captcha API key into the software, this process is very simple you will only need to press on Settings button > and then go to "Captcha services" tab and insert your captcha API key and then you need to press on "check Balance" button to make sure the captcha KEY is inserted correctly. If you will see the message "Invalid API key" then you need to check again the API key (use copy paste), after you press to "Check Balance" button and you will see the message showing you a number like : $10 (depends on the amount you have purchased) then you can press on save button and go to the next step. Now the software is installed, everything is configured correctly, and it is the time to start the first campaign, press on "New campaign" button and in the new window you can start to fill in your details, first you need to insert your website URLs, I usually prefer to insert 3-5 internal pages URLs (including also the homepage URL), next step is filling in your keywords (the keywords are the words that you want your website to be ranked on fist pages of google), now is the time to insert your article, I always use the articles that the software will create automatically and you only need to press on "Create unique articles using MR Article Builder" this will auto create the articles that are 100% unique and related with your keywords, self article creation it is a feature that is actually saving a lot of time. Next step is selecting of diagrams, diagrams are special seo strategies that are using multi tiers of backlinks, basically the links that are created by the software have multi tiers like : tier 1 of links can be blog links > tier 2 can be web 2.0 profiles links that are pointing to blogs tier > tier 3 of links are pointed to tier 2 and tier 2 to tier 1, this process is actually sending and multiply the "juice" throw tiers and it makes each link much more powerful, it is probable the best ranking solution that exists, I usually use the first medium diagram from the list (I also use some diagrams created by me that offer very good rankings, you can find my seo diagrams designed by me here). After all this campaign details are filled in you need to press on "Start Campaign" button, and now is the time to sit back and relax, Money Robot will do the rest of the work. This was my simple Money Robot tutorial for beginners. I will try soon to make one more tutorial for experts where I will show the advanced and hidden features of MR. Very good tutorial Edy, it helped me a lot, the software seems to be very easy to use, I just needed to find out how to start it, I have a friend that makes a lot of money using this tool, but people after make good money they never share how they actually make them or share how they use the Money Robot Software, please make more tutorials showing the hidden features from MR, I know that they are some hidden features and I will be very happy to find them. Thanks again for your good tutorial. 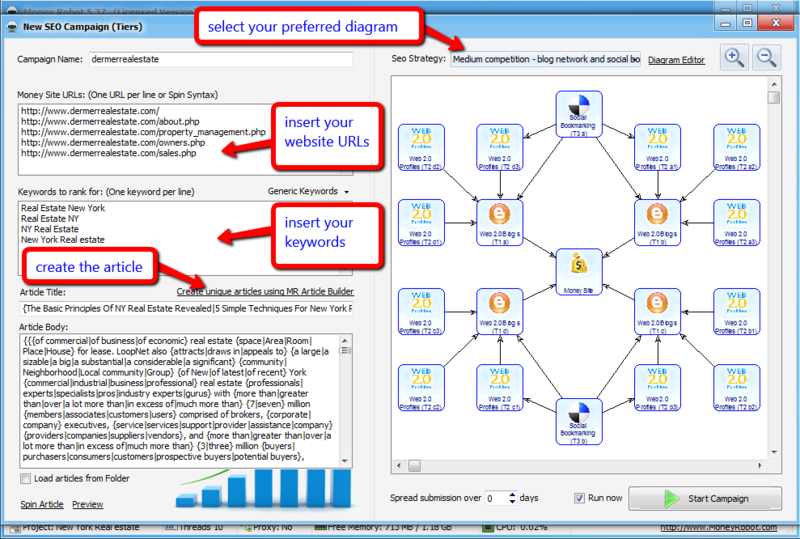 The most powerful seo tool for high quality link building ! one of my friends make over $200 per day with the help of this software, I just purchase it, hope to get same results ASAP, thank you for tutorial it is very useful, people that make good money don't share their tricks, I also ask you to make a tutorial with the hidden features and tricks of Money Robot PLEASE, thanks. Hi, no need to run more profiles, the 2 web 2.0 blog tasks don't need more profiles, unlimited tasks can be made with the same profile, the software auto creates the default profile, so no need to create any profile manually, however, if you have your own domains you can create multiple profiles to the software and it will provide a little better success rate of submission, here is a link where you can see how to create web profiles, however you don't need to create any profiles manually from start. I think most of the people never creates a web profile and that is not a problem, I also didn't create any profile from start and I get good rankings fast, I have now created my own web profile because it gives a little better success rate, but people that don't create any web profile and use the default profiles from the software have same similar good ranking results. 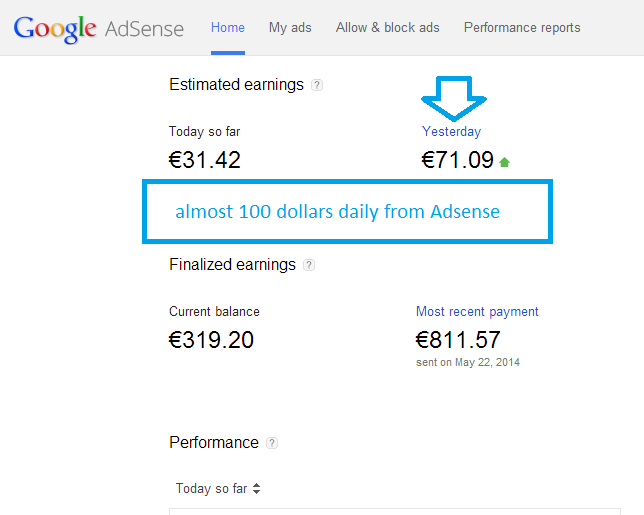 For those who use Adsense I will share a little secret, the secret to make good earnings daily from Adsense is to get into high niches, the niches that pays $10 per click are the best, take only the niches that have a high cost per click, and build more campaigns for each page from your site, even if the daily clicks are not too many the cost per click will be high and it is easy to make 50 Euro per day. I have finished about 20 campaigns to my site now and my Adsense earnings changed my life, I will soon quit my job and spend all my time building Adsense sites. I have used about 12 medium campaigns and 6 high campaigns, to rank my site, my current traffic is 120 daily visits per day with 25-35 clicks on adsense ads, but because the cost per click is high the earnings are very good. I also ranked one more site in a low cost per click niche and it makes only 8 - 12 Euro per day having 40-50 clicks per day, so the secret of good earnings is getting from start an higher cost per click niche site !!. I love Money Robot Software !! Post your earnings here !